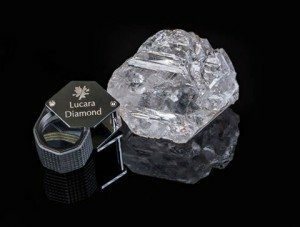 VANCOUVER, BRITISH COLUMBIA–(Marketwired – Nov. 18, 2015) – Lucara Diamond Corp. (TSX:LUC)(BOTSWANA:LUC)(NASDAQ OMX Stockholm:LUC) (“Lucara” or the “Company”), the high quality diamond producer with assets in Botswana, is pleased to announce the recovery of a 1,111 carat gem quality, Type IIa diamond. Please see attached photos. The magnificent stone, which originated from the south lobe of Lucara’s Karowe Mine, is the world’s second largest gem quality diamond ever recovered and the largest ever to be recovered through a modern processing facility. The stone was recovered by the newly installed Large Diamond Recovery (“LDR”) XRT machines. The stone measures 65mm x 56mm x 40mm in size and is the largest ever to be recovered in Botswana. For additional pictures of the diamond, please go to the Lucara website www.lucaradiamond.com.